A rheumatologist is an internist who is qualified by additional training in Rheumatology and experience in the diagnosis and treatment of arthritis and other diseases of the joints, muscles and bones. Rheumatologists mainly deal with clinical problems involving joints, soft tissues and allied conditions of connective tissues. Rheumatologists treat arthritis, certain autoimmune diseases, musculoskeletal pain disorders and osteoporosis. There are more than 100 types of these diseases, including rheumatoid arthritis, osteoarthritis, gout, lupus, back pain, osteoporosis and tendonitis. 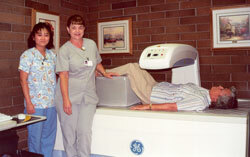 The Rheumatology Department at Beaver Medical Group also has a Dexa Scanner which measures bone density.